Princess Alice of Battenberg, christened Victoria Alice Elizabeth Julia Marie (born 25 February 1885 at Windsor Castle – 5 December 1969 at Buckingham Palace), later Princess Andrew of Greece and Denmark, was considered the most beautiful princess in Europe. She was born completely deaf, yet learned to read lips at a young age and could speak several languages. Alice grew up in Germany, and was the great-granddaughter of Queen Victoria. In a time when royalty had little to do with the commoners, she was an unconventional royal who placed the importance of people over privilege and wealth. She was devoted to helping others, and in the turmoil of her own personal life never lost sight of her devotion to God and her commitment to helping those less fortunate. 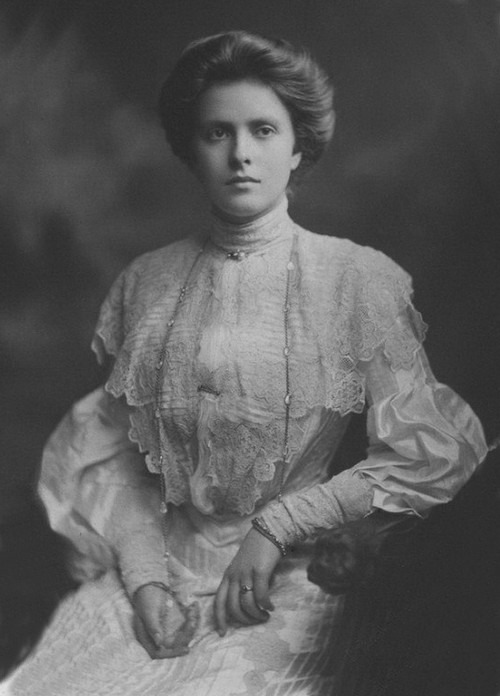 At the age of 17 she fell in love with Prince Andrew of Greece, and they were married in 1903. They had four daughters and one son; their daughters went on to marry German princes, and their son Prince Philip married Elizabeth II, Queen of England; Alice is therefore the grandmother of the Princes Charles, Andrew, Edward and Princess Anne. She and her family lived in Greece until political turmoil caused the royals to flee in exile in 1917, when they settled in a suburb of Paris. Alice began working with charities helping Greek refugees, while her husband left her and the children for a life of debauchery and gambling in Monte Carlo. She found strength in her Greek Orthodox faith, yet relied on the charity of wealthy relatives in that period of her life when she had no home to call her own, and no husband to help raise her children. 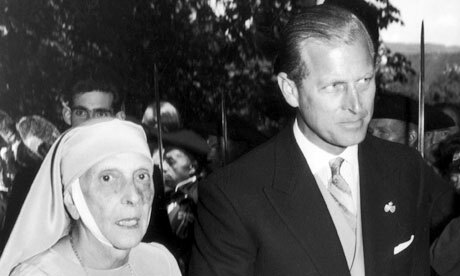 Understandably through the stress of circumstances, she had a nervous breakdown in 1930; dubiously diagnosed with schizophrenia, she was committed suddenly and against her will to a mental institution in Switzerland, without even the chance to say goodbye to her children (Prince Philip, 9 at the time, returned from a picnic to find his mother gone). She continually defended her sanity and tried to leave the asylum. Finally in 1932 she was released, but in the interim her four daughters had married (she had thus been unable to attend their weddings), and Philip had been sent to England to live with his Mountbatten uncles and his grandmother, the Dowager Marchioness of Milford Haven. After the war ended, Alice went on to take the example of her aunt, Grand Duchess Elizabeth Fyodorovna (who had been formulating plans for the foundation of a religious order in 1908 when Alice met her in Russia at a family wedding), and founded a religious order, the Christian Sisterhood of Martha and Mary, becoming a nun (though she still enjoyed smoking and playing cards) and establishing a convent and orphanage in a poverty-stricken part of Athens. Her habit consisted of a drab gray robe, white wimple, cord and rosary beads. In 1967, following another Greek political coup, she travelled to England, where she lived with her son Prince Philip and her daughter-in-law, Queen Elizabeth II at Buckingham Palace until her death in 1969. Her final request was to be buried near her sainted aunt in Jerusalem; she was instead initially buried in the royal crypt at Windsor Castle, but in 1988 she was at last interred near her aunt in the Convent of Saint Mary Magdalene on the Mount of Olives in Jerusalem. In October of 1994 her two surviving children, the Duke of Edinburgh and the Princess George of Hanover, went to the Holocaust Memorial in Jerusalem to see their mother honoured as one of the “Righteous Among the Nations” for having hidden Jews in her house in Athens during the Second World War. Prince Philip said of his mother’s actions, “I suspect that it never occurred to her that her action was in any way special. She was a person with a deep religious faith, and she would have considered it to be a perfectly natural human reaction to fellow beings in distress.” In 2010 the Princess was posthumously named a Hero of the Holocaust by the British Government. Posted in Essay, History, Military History and tagged Athens, Captain Corelli's Mandolin, Deaf Princess, Germany, Greece, Greek Orthodox, Hero of the Holocaust, Jews, Nicholas Cage, Paris, Penelope Cruz, Prince Charles, Prince Philip, Princess Alice of Battenberg, Queen Elizabeth II, Queen Victoria, Righteous Among the Nations, Second World War, Switzerland, the Christian Sisterhood of Martha and Mary, Windsor Castle, world war 2. Bookmark the permalink.